I’m half way through making the first of many skirts from my own custom block. After drafting a block from my measurements, fitting and adjusting a toile, and copying the adjustments back onto paper, I have block which I can trace to give me custom-fitted patterns. My first skirt pattern is as simple as it can get; a-line (following the angle of the hip down to the hem), side-fastening, lined, and waist band-less. The skirt starts 2 cm below the waist and the hem is just above the knee. When it’s finished it will have an invisible hem, it is tacked in place for the moment. 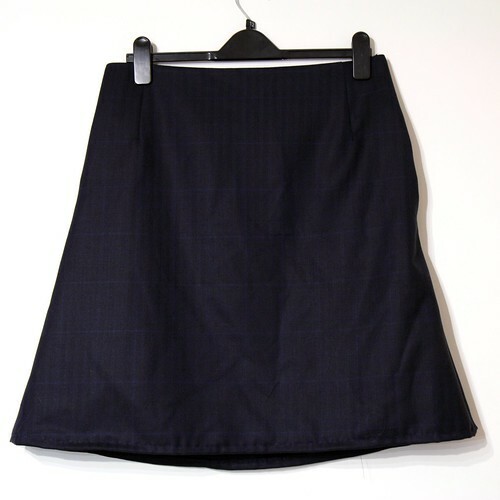 Fitted a-line skirt in British wool suiting. The skirt construction is a bit unusual but it’s one that I use a lot. The self-facing (with interfacing) acts as an internal waist band, with the lining attached to it. This adds a bit of structure to the garment and gives a very neat finish. The pattern for facing is created by tracing the skirt block, pivoting at the darts to create a single pattern piece for each half. A concealed zip will go in the side, opening from the hip line. The lining and facing will be hand-stitched around the zip. Feeling environmentally concious about my clothing and crafting choices lately, I’ve used British wool suiting for the main fabric. 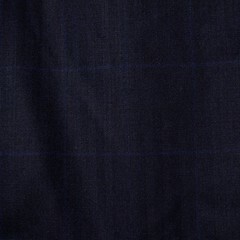 It’s dark navy herringbone with a subtle mid blue check. Marvellous quality too, it hangs beautifully. I have a bit of an addiction to tweed and suiting, much of it acquired from British Fabric eBay shop. The lining is a fine cotton print, second hand, also from eBay. I’m going to decorate the hem with military gold braiding, exact design to be decided. I’m looking to the inimitable Jimi Hendrix for inspiration! 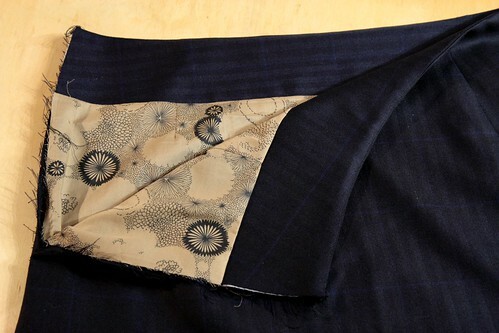 Wow, such gorgeous suiting fabric! The floral lining fabric is a wonderfully delightful secret, too. Thanks for the instructions for pattern making. Can you just explain whether the lining goes all the way to top of waistband and also what you mean about pivoting darts for facing – is that where you cut the dart and piece back together?